Barcelona lined up in their standard 4-3-3 formation which has a significant focus on the facilitation of what is the best front 3 in the world. Claudio Bravo started as goalkeeper and made a vital penalty save early on to maintain a lead. Ahead of him, the starting centre-back partnership was of Pique and Mathieu, who were flanked by Adriano and Dani Alves. Mascherano started as the defensive midfielder, leaving Busquets in a higher position alongside Xavi. Suarez had an excellent match as the striker of the front 3, whilst he was supported by Neymar and Messi on either side. Valencia’s loss was the end of an impressive 10-game unbeaten streak, and the away side made little variation to their usual system, playing in the 4-3-3/4-2-3-1 which has been the standard for large parts of this campaign. Diego Alves started behind a back four of Orban, Otamendi, Mustafi and Barragán, whilst Javi Fuego was the deepest in the midfield and accompanied by Gomes and Dani Parejo who unusually made quite a poor performance. Feghouli and Rodrigo supported the attacks from the touchline, the Algerian in particular who was one of the better players for the away side, whilst Paco Alcacer lead the line as a lone striker. Valencia have had a very impressive season after what was a poor campaign last year. They have been analysed in detail on Spielverlagerung by TT! As ever, Valencia looked to press high up the pitch, which lead to a number of regains from dangerous positions close to Barcelona’s box. In this, Alcacer was often supported by a winger or a central midfielder at times as they needed to commit numbers forward as the opposition began the possession from often very deep areas of the pitch. Valencia’s use of a central midfielder to support Alcacer’s press. They particularly looked to have an emphasis on pressing in the lateral spaces of the pitch. Under Luis Enrique, Barcelona have adopted much more of a wing focus, particularly through the right side where Messi combines excellently with the midfield. Given this, the intentions of the away side were possibly an attempt to restrict such situations arising, as they shifted quite well to maintain a compact structure, whilst the man-marking often reduced the options of the ball-carrier to a considerable degree. Their situations of wide pressing was often based around the ball-near winger, and support in the man-marking of the near central players and full-back. In what is quite a simple mechanism, Valencia looked to utilise the touchline which already restricted the ball-carrier’s options in terms of movements, whilst covering deeper passing options to force a pass which could be contested immediately with good pressure. They employed what was somewhat of a 4-1-4-1-0 formation out of possession too. This wasn’t necessarily in their pressing, but once Barcelona had enjoyed a sustained period of the ball where Valencia dropped into more of a mid block, only looking to pressure when the ball was moved into the midfield. Such a formation entailed Alcacer marking Mascherano, leaving a hypothetical 4v3 in the centre in the favor of Valencia. Valencia’s situational 4-1-4-1-0 shape, with Barcelona’s wide players inside to exploit the half-spaces. With the numerical advantage, Parejo and Gomes were left free to man-mark their respective opposition midfielders whilst Fuego had the freedom to mark zonally. This was presumably in an attempt to stop any direct passes targeting the 10 space, as Valencia obviously wanted to minimise Barcelona’s ability to penetrate the midfield with vertical passes into the front 3. 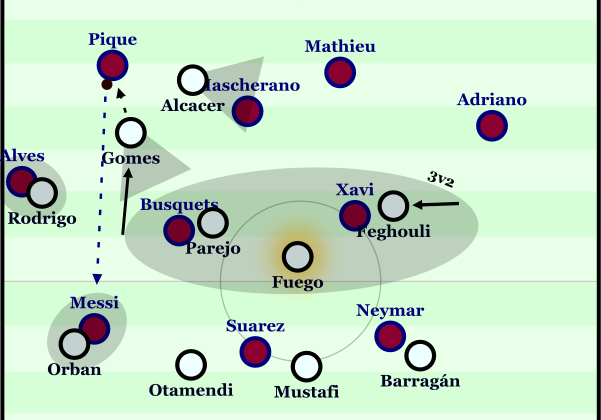 Here it shows more of a 4-3-2-1, however this is simply a reaction to the orientation of the Barcelona players in this specific scene. in some situations, Valencia were pushed into a 5-4-1 formation by an advanced full-back. This resulted in at times a poor cover of the midfield, which looked susceptible to overloads as the ‘4’ was stretched too. possibly in an attempt do so, Messi and Neymar both made inside movements which caused some threatening scenes throughout the game, especially in the second half. Valencia’s 5-4-1, with both Messi and Neymar in the channels to exploit. Because Valencia were so focused on their man-marking at times, Barcelona held the ability to disorganise their structure to a greater extent than average. Aspects which are so common in their game such as combination play and movement off of the ball (albeit to a lesser degree now perhaps) allowed Barcelona to beat the man-marking pressing and exploit a poorly-structured block as a result of this. At times, their combination play was at a speed high-enough that Valencia’s pressing simply couldn’t keep up, whilst the rapid changing of ball location meant that the pressers often had to change direction of their movement both too quickly and too frequently in some scenes. Messi was crucial in their exploitation of this, as his movements inside not only created overloads at times, but his pressing resistance often negated the attempts of Valencia as he broke the midfield line on numerous occasions purely through his unbelievable close dribbling. Neymar made similar movements as both wide players dropped into their respective half-spaces at times to improve the ability to penetrate Valencia’s well-organised midfield. 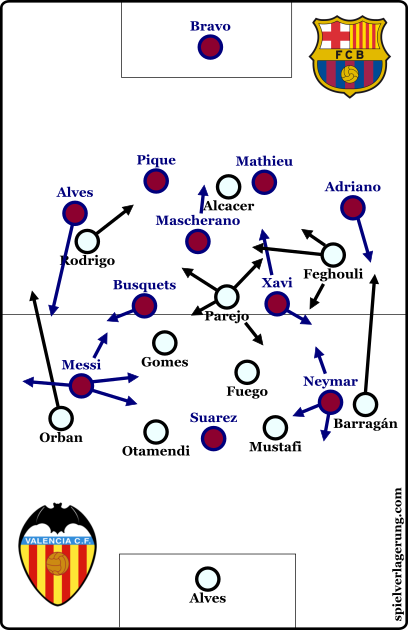 Barcelona’s emphasis on counter-attacking also was used against Valencia’s system out of possession. With the front 3 often staying high they could minimise any attempts of Valencia to counterpress as space was often available amongst the defensive line to exploit. This was the case in the first minute, where the midfield used vertical passing to perhaps it’s best use as the trio bypassed Valencia’s counterpress well, allowing Busquets to play a great through ball which created a 3v2 and the opening goal of the game. Valencia recklessly leaving a 3v3 in the first minute of the game. Enrique also brought on Rakitic following the break, which could have also been an attempt to aid his team’s possession game against Valencia. Because Mascherano has a very simplistic role in possession and rarely supported to advance their game, he offered little. This was highlighted as Alcacer could simply mark him which meant that they had to rely on the movements of the front 3 to win the midfield battle. Thus by moving Mascherano into the defence for the introduction of Rakitic who is obviously much more of a presence in the midfield and can contribute to the development of the ball more, Valencia’s pressing became more difficult. The new trio of Busquets (DM), Xavi and Rakitic were less basic and all 3 supported well in the midfield. This showed as Messi could then move into the centre after Suarez’ substitution – he wasn’t needed as greatly in the midfield support as Pedro obviously doesn’t fulfil the same role on the right. In a game where he reached a milestone of 400 goals in all competitions, Messi was again dominant and often vital for Barcelona. Even in deeper possession, the Argentinian dropped to aid the progression and worked against Valencia’s pressing. In these situations, his involvement in combination play worked well against the opposition’s pressing whilst he often created numerical overloads as Orban didn’t follow him to such an extent. Messi’s combinations and overloads in deep areas allowed them to bypass Valencia’s press. His inside movements during the second phase of possession were also important. From here he not only provided a presence in similar combination plays, but his dribbling and often undervalued passing ability was a key factor in the home side bypassing Valencia’s pressure. To defend against Messi, teams will often push multiple players onto him at a time, to similar try and stop him individually, however this obviously then creates at least one free player whilst space often is opened between the lines. His precise passing allowed Neymar and Suarez to utilise these situations on a number of occasions. From this position he plays through to Neymar who is free to run into the box. The league’s leading assist-maker could at times be found on the left wing, such is the freedom of his role. From these areas he could combine well with Neymar and simply utilise the superiority in quality to break down the Valencia defence. In alternative cases, he moved out onto the touchline whilst Alves situationally underlapped. From these spaces, a 1v1 was created between Messi and either Orban or Rodrigo which was clearly favourable for the home side. Generating 1v1 situations is an effective method of breaking down compact defences – it has also been used in their games against Atletico Madrid this season too. Defending is all about the distribution of space between players, and the control of space as a team; by drawing players out and creating 1v1 situations, you not only disrupt the distribution of space but also weaken their control collectively. Performances such as this one have become common of Messi, as he has taken on a much more supportive role this season (though 35 La Liga goals scored says everything about the player). Especially later on, Barcelona tried to facilitate Messi’s passivity and inactivity out of possession. During the first half, this was largely done by Suarez whose work rate can often suffice for the two, whilst he often rotated positions with his South American teammate. Through this Messi was allowed to stay in areas of the pitch where not only was their less action, but he had more teammates around to support him. Here they created a Real Madrid-like 4-4-2 to balance Messi and stopping his inactivity from negatively impacting the structure. This could be compared to the system of Real Madrid out of possession, where a 4-4-2 is created through the shifting of the midfield line – something Barcelona did situationally in this game. The difference being how worthwhile the defensive support of Ronaldo is, in comparison to Messi. This is necessary to a greater extent with Ronaldo, as Messi is only inactive sporadically whereas for Ronaldo it can be for the large majority of the game. Aside from this, it could be argued that the Portuguese forward destroys any balance in the side as well as a number of other issues however that is a whole article in itself. Great article once again. The la liga articles are always special highlights because of the convincing use of the screenshots. Do you think playing Mascherano in midfield could be a useful option for Enrique in the matches against Bayern. I can imagine it but personally I don’t really like it because the point that’s mentioned in the article (Mascherano offers less than the other options in case of possesion and attacking). And in my opinion Busquets brilliance is also partly wasted when he’s not playing as the single pivot. However it’s imaginable because it might strengthen the defense. I think in midfield, Enrique has to decide between Busi or Mascherano – and we all know which one he prefers. With the two, there are some issues in the possession game which showed in this match actually – you’re correct in saying the shape of two 6s can limit Busi whilst Mascherano doesn’t offer many attacking qualities. Theoretically it may be a good move to strengthen the defence, but in practice I don’t think it would be a successful move overall because of the alternative issues which could arise. Thanks for the answer. Okay, if it just goes between Busquets OR Mascherano, then it´s obvious who will play of course.